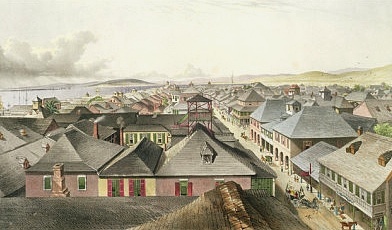 This view over Kingston before the 1843 fire, by Joseph B.Kidd, shows the chimneys and shingled roofs of buildings near the water front. Those are the illustrations inserted into Harry Vendryes' article reproduced below. Broadcast by Mr. Harry E. Vendryes over Z.Q.I. on Wednesday 17th September l947 at 9.15 P.M. under the auspices of the Jamaica Historical Society. In this series which commenced with the Earthquake Fire of 1907 and subsequently dealt with “Feurtado’s Fire” of 1882, a fire which laid waste a large part of the commercial area of the city, it will be observed that the plan of presentation involved proceed­ing backwards in history and in conformity with this, it is now proposed to deal with the great fire of 1843, which was to become known as “James the Founder” or “Matcham’s Fire”, because of its origin in the Iron & Brass Founding establishment of Messrs James & Co., in which Charles James & Mr. Matcham were partners. Although we are now dealing with incidents which happened more than one hundred years ago, many sources of information are avail­able and have been consulted, notably newspapers of the period preserved in the West India Reference Library; but increasing dif­ficulty has been met with because of changes which have occurred in the names of certain of the city streets, for instance, the eastern end of Barry Street was known as LOMBARD St., the eastern end of Tower Street was THAMES St., the eastern end of Laws Street was called NILL St. [in fact the name was MILK St., J.L. ], and the upper part of Rosemary Lane was CHANGE ALLEY. Overcoming this, a marked similarity is at once observed in these Fires. They generally occurred during a heavy seabreeze and fed by the wind and assisted by the highly inflammable nature of the shingled roofs and wooden construction of the buildings of the period, (a condition which was aggravated by the dry season through which the city had passed) were all extinguished by the pre­sence of a large area of open land in their path, the “Parade” or “Victoria Park” as it is now known, though in this case, the flaming shingles, propelled by favourable winds, carried the fire to roofs more than one mile from its origin thus creating a blazing inferno among what was only minutes before a peaceful and happy community. At this stage we might pause and learn something of the conditions which existed at that period. There was no police Force and no organised Fire Brigade in the ordinary sense of the term. There appears to have been a Fire Chief or Superintendent whose job was part time and several centres where fire fighting equipment in the form of portable pumps were located; but there does not appear to have been an organised crew for manning them - certainly there were no whole-time firemen. The system therefore involved the use of Volunteer labour for operating the pumps which obtained wa­ter from wells located throughout the city. It must be observed that there was no piped water supply from a central reservoir such as we now employ; but there would appear to have been a supply of water from the Hope Water Works by means of a gutter which ran down Orange or Princess Street. James’ Foundry was situated on Harbour Street at the corner of Rosemary Lane, on premises now occupied by the United Fruit Co., and this narrow, shingled building, running down to the sea, was divided into various sections by wooden partitions. At 12 o’clock on August 26th 1843, while casting brass, the molten metal appears to have overflowed from the moulds and igniting one of these par­titions, soon located itself in a room where wooden patterns were stored and from which it soon climbed to the roof. 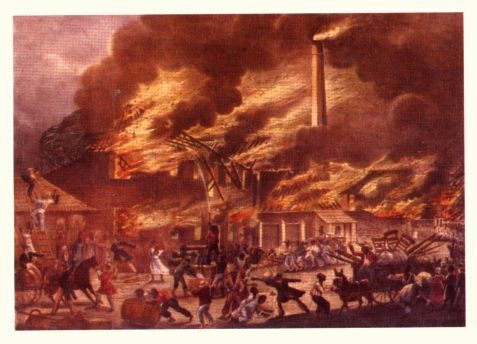 A general alarm was not however sounded, as fires in James’ Foundry were of common occurrence and the workmen had always been able to combat them without outside assistance. Valuable time was thus lost and when the alarm was finally sounded by means of the Foundry bell at 12:30 P.M., no one appears to have paid partic­ular attention, as it was the custom for this bell to be rung for the lunch hour and when the people in the vicinity were at last aware of their awful danger, the entire Foundry premises was al­ready almost consumed, the shingled roof being one mass of flames, spreading in a few minutes to neighbouring wooden buildings housing a saw mill and steam bakery, almost before the inhabitants of King­ston could collect themselves, the fire was in the very centre of the city. By 3 o’clock there were no less than 10 fires raging in widely separated areas each involving 3 or 4 houses at a time and Hector Mitchell, Mayor of Kingston, appealed to the Naval Forces at Port Royal for help while Messrs Lundy & Co., dispatched a steamboat to bring back the blue-jackets with their fire engines, hooks and lad­ders. The Military sent down a detachment of the 2nd West India Regiment who were stationed at Up Park Camp and the English Rifles were marched down from Newcastle to assist in the securing of pri­vate property. The engineers, with their artillery and guns, being also utilised in the destruction of many buildings which lay in the path of the flames. By 4 o’clock these 10 fires had been localised into 2 fairly clear-cut divisions or blocks, the major one of which stretched from the western side of Hanover Street to the East Parade and from the southern side of Sutton Street, an area in which every building, with the exception of the present Coke Chapel, was to be completely destroyed. The other area extended along the seashore from Hanover Street to Highholborn St. and narrowed down somewhat on its northern boundary on Laws St. where it stretched from Hanover Street to Maiden Lane. This was also a raging in­ferno and excluded only the Wesley Chapel which appears to have been saved by the devoted labours of its congregation and others who placed wet blankets on the roof and kept them constantly saturated. The plight of the people can better be imagined than described. thousands had in a few hours been reduced from positions of luxury to the most abject poverty and want. Entire blocks of handsome dwellings, where lived the merchants and other gentry of the city, were burnt to the ground, often without the occupants being given an opportunity of securing even their furniture, only minutes hav­ing elapsed after they had been made aware that the roof of their residence was on fire. The prisoners from the gaol were transferred to the Penitent­iary and arrangements made for the removal of the inmates of the Lunatic Asylum and Hospital which was then located near North & Princess Street, flaming shingles having already been carried to adjoining premises, indeed, these very effective torches were carried by the wind to ignite the roofs of buildings as far north as Hannah s Town. By 5 P.M. the seabreeze began to abate, giving the terror-stricken inhabitants some breathing space in which to recover from their exertions; but this was only too soon followed by a stiff wind from the North which blowing the flames towards the sea com­pleted the destruction of those areas to the south, which had been fortunate to escape earlier in the day. This new source of terror continued throughout the night to finally spend itself at about 5 o’clock the next morning, partly because the wind had died down and because, the flames having reached the water’s edge, there were no more buildings to be consumed. The scarcity of water, for the wells were by this almost dry, and the smouldering embers, which could at any moment burst forth into renewed activity, caused grave concern as the morning of Sunday 27th progressed and the survivors of the catastrophe awaited the return of the seabreeze; but fortunately the work of the engineers, in blowing up the adjacent premises, was effectively done, thus isolating the affected areas and finally removing all cause for further alarm. That Saturday night remained for long in the memory of the survivors. To those who watched it from the outskirts, the city presented the appearance of an active volcano and this effect was heightened by the lurid flames and dense columns of illuminated smoke which rose for miles above a city flaming almost from end to end. The conduct of the ordinary citizen during this dreadful calamity appears to have been highly reprehensible. If we are to accept the Printer’s report which appeared shortly after, the major­ity were generally uncivil, sulky, riotous, drunken and disorderly. Over 30 city blocks had been completely demolished either by fire or by deliberate destruction in an attempt to stop its progress. In addition to which the loss of property by theft was enormous, the plunder being beyond the possible calculation of anyone. Bundles of plunder were discovered far to the west in other par­ishes and boatloads of loot were moved from the city’s waterfront to Port Royal. There would be very little point in repeating here a list of the fire sufferers, as having lived in the city over a hundred years ago, their names would be unknown to the present generation; but going through the records, it read like a Who’s Who, over 600 buildings having been involved, which included houses, dwellings, tenements & business establishments to a total value of possibly half a million pounds sterling. 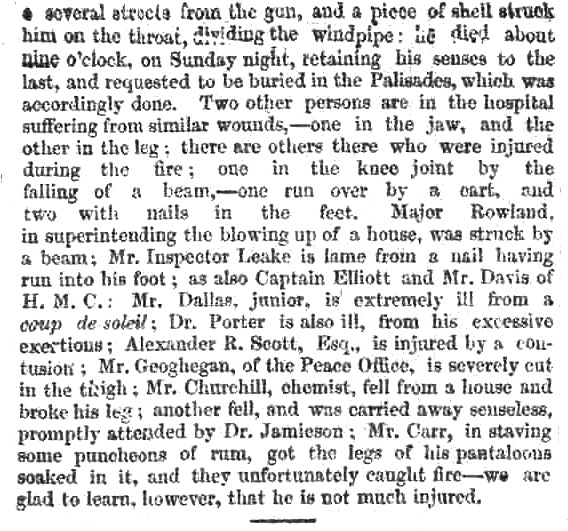 Fortunately the casualties appear to have been slight, the only fatality having been caused by an exploded shell, fired by Engineers in the destruction of a building and portions of which carried several blocks away, severed the wind-pipe of Mr. Ebenezer DePass, one of the city’s honoured citizens. It would appear that the inhabitants after they had recovered from the initial shock of the awful calamity soon commenced plane for the development of the areas affected and began the laying down of pipes to carry water through the principal streets and for the establishment of a regular Fire Brigade service, though how effective all this was to be, may be questioned by the several major fires from which the city later suffered. "Here rests the remains of Ebenezer DePass who, after lingering for two days, died from a wound inflicted by a shell discharged during the great fire of Kingston. August 26, 1843. Aged 40 years. He possessed all the attributes that made a man beloved and respected. This tablet is a slight memorial of the affection of his widow and orphan boy." How slowly and gradually I succeeded in life, need not be told at length. My fortunes underwent the variations which befall all. Sometimes I was rich one day, and poor the next. I never thought too exclusively of money, believing rather that we were born to be happy, and that the surest way to be wretched is to prize it over-much. 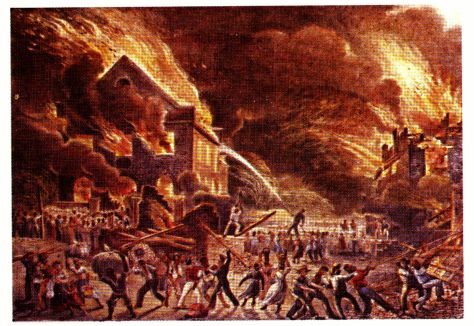 Had I done so, I should have mourned over many a promising speculation proving a failure, over many a pan of preserves or guava jelly burnt in the making; and perhaps lost my mind when the great fire of 1843, which devastated Kingston, burnt down my poor home. As it was, I very nearly lost my life, for I would not leave my house until every chance of saving it had gone, and it was wrapped in flames. But, of course, I set to work again in a humbler way, and re­built my house by degrees, and restocked it, succeeding better than before; for I had gained a reputation as a skilful nurse and doctress, and my house was always full of invalid officers and their wives from Newcastle, or the adjacent Up-Park Camp. 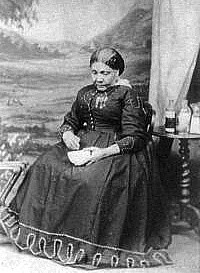 Wonderful Adventures of Mrs Seacole in Many Lands , Chapter 2. WEST INDIES.—The mail-steamer Tay, which left Nassau on the 12th September, arrived at Southampton on Thursday, with intelligence from Jamaica to the 5th September. 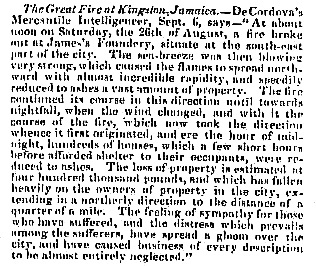 Kingston had been visited by a dreadful fire. It broke out, as it is supposed accidentally, in the Western part of the city, near the furnace-room of James's Foundry, about noon on the 26th August; passed to a timber-yard; and, fanned by a sea-breeze, spread from house to house and street to street, until checked by the land-breeze at night. The change, however, turned the course of the flames, and threatened a new part—the commercial part of the town—with destruction. Happily, all wind subsided at midnight; and at daybreak the fire was mastered. Several naval detachments were called out to aid in extinguishing it; the Black population being accused of apathy. The destruction of property was great - 400 homes were burned down, and the loss is roughly calculated at 250,000l. Several persons were hurt but only one was killed—Mr. Ebenezer Depass, who was fatally wounded by a broken shell from a field-piece, used to batter down some houses to stop the fire. Subscriptions had been set on foot in various quarters, and an appeal is as to be made to England. ​AT KINGSTON, JAMAICA. Advices from Falmouth of the fifth announce the arrival on the previous day of the West Indian Steamer Tay. By this arrival we are put in possession of the particulars of a most fearful conflagration, by which a very large part of the city of Kingston has been reduced to ashes. The account runs thus :—"At about noon on Saturday the 26th of August, a fire broke out James's Foundry, situate at the S.E. end of Kingston, Jamaica. The sea breeze was then blowing very strong, which caused the flames to spread northwards with almost incredible rapidity, and speedily reduced to ashes a vast amount of property. The fire continued its course in this direction until towards night-fall when the wind changed, and with it the course of the fire, which now took the direction from whence it first originated, and ere the hour of midnight hundreds of houses were reduced to ashes. The loss of property is estimated at £400,000, and which has fallen heavily on the owners of property on the eastern side of the city, extending in northerly direction to the extent of a quarter of a mile. The feeling of sympathy for those who have suffered, and the distress that pervaded among the houseless had thrown a gloom over all classes, and caused business of every description to be almost entirely neglected. 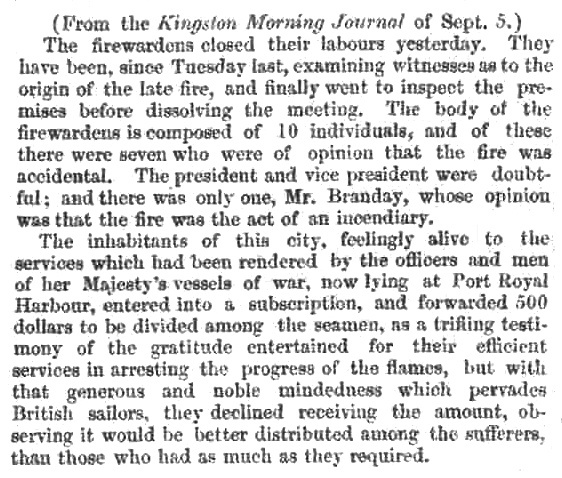 On the supposition that the fire was the act of an incendiary, £1,000 .were offered by the mayor of Kingston, as a reward for the discovery of the offender." DREADFUL FIRE AT JAMAICA.-The Royal mail steamer Tay arrived at Falmouth on Wednesday night, with mails from the West Indies and Mexico. M. Ceuto came passenger in this vessel, and was the bearer of dispatches from Gen. Santa Anna. The Tay brings information of a dreadful conflagration, which broke out at Kingston, at mid-day of the 26th of August, destroying 400 houses, and a vast deal of other property, to the amount of 250,000l., computed at a rough calculation. There was one life lost - that of a gentleman. 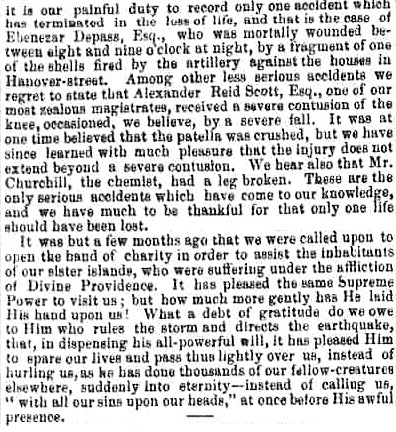 who was killed in consequence of the bursting of a shell, and many others met with severe accidents. The fire broke out in the western part of the town, and continued burning for twenty-four hours before its ravages were stopped. 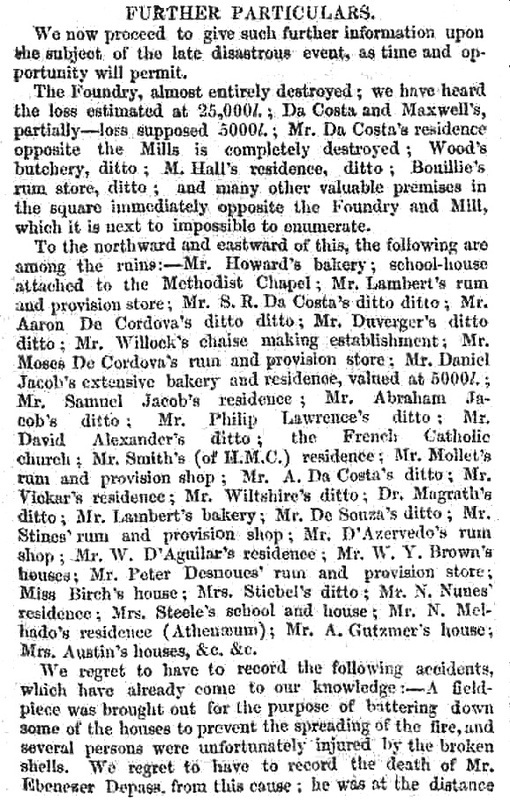 Subscription lists had been opened in various directions for the relief of the sufferers. The Foundry is almost entirely destroyed. Da Costa and Maxwell's loss supposed 5,000l. Mr Daniel Jacob's extensive bakery and residence, valued at 5,000l. JAMAICA: It appears that the effects of the recent fire at Kingston have been most disastrous. Numerous public meetings had been held in various parts of the island for the purpose of collecting subscriptions to alleviate the distresses of the sufferers. At Kingston, the scene of the dreadful disaster, the subject uppermost in the public mind is the relief of the sufferers. Much sympathy has been created in their behalf, not only in the city itself, but throughout the whole island, and efforts are being made to afford them something more than temporary relief. 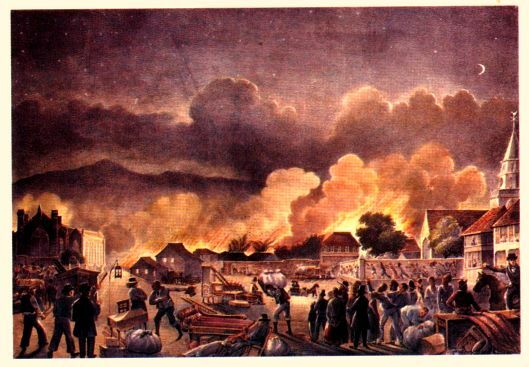 The merchants of Kingston, grateful for the assistance afforded by the army and navy on the occasion of the fire, have made up two purses, one of 500 dollars, for distribution among the latter, and one of 1,000 dollars, for the former; both of these, however, were declined. In doing so, Captain Houston, the senior naval officer on the station, feelingly remarked that the money would be much more advantageously placed to the relief of the sufferers. Major General Berkeley, on the part of the army, declined also, and expressed himself in similar terms. A terrible fire laid a large portion of the city in ruins, several years ago, and only a portion of the houses have been rebuilt. These are commonly one story high only and very mean. In the busiest parts of the city, and on every block, may be seen vacant lots, on which are crumbling the foundation walls of houses long in ruins. The city was much injured by an extensive fire on the 26th August, 1843, and owing to the poverty of the times, little of the injured part has been rebuilt; but it has many delightful residences in the upper streets; albeit the suburbs are most wretched hovels, and filthily dirty.